7 years ago or so, we both spent a couple of weeks with friends cycling through the Japanese countryside. The scenery, the people, the culture. We soaked up as much of it as we possibly could. But if there’s one thing we remember more than anything else, it’s the food. And not just any food, but ramen. Magical ramen. So when Ellie from Mayse Artisan Bakery in Hong Kong got in touch to say she’s in London and then went on to suggest making vegan ramen for us, we obviously jumped at the chance! 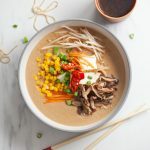 Ellie’s recipe is not just packed with the deep ‘brothy’ flavour you want in a ramen, but it’s also really simple, too. Just how we like things at So Vegan. And if you love this, then you’ll totally love our debut 5-ingredient cookbook So Vegan in 5, which is out right now. Place a frying pan on a medium heat. Once hot add the sunflower seeds and fry for 2-5 minutes until lightly golden brown, stirring frequently. Keep an eye on the seeds so that they don’t burn, then transfer the seeds to a small bowl and return the pan to the heat. Pour 2 tsp of sesame oil into the pan. While the oil heats up, peel and dice the shallot and garlic, then add both to the pan and fry for 5 minutes. Transfer the cooked shallot and garlic to a small bowl and return the pan to the heat again. Turn the heat up to medium-high and pour the remaining 2 tsp of sesame oil in the pan. Slice the shiitake mushrooms and add the to the frying pan along with a pinch of salt and fry for 12-15 minutes, until golden brown and fully cooked. Add half the shiitake mushrooms to a blender and leave the other half to one side to use as topping later. 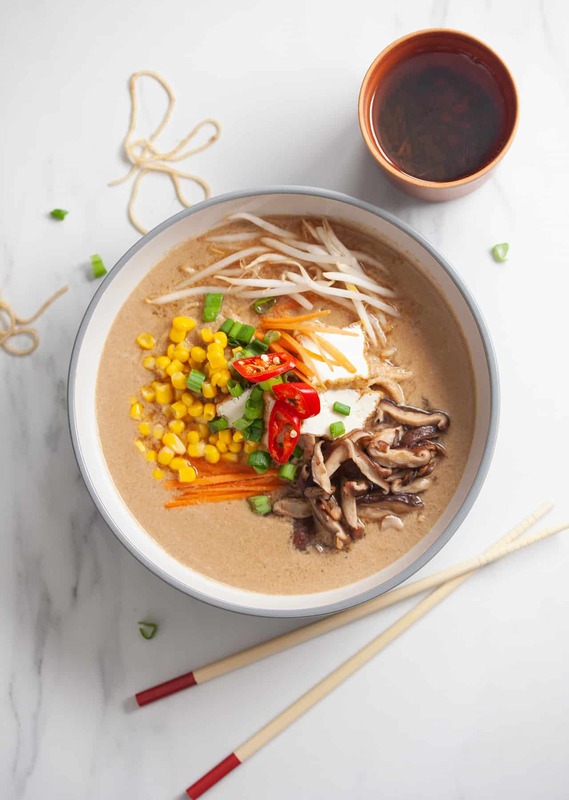 To create the broth, add the toasted sunflower seeds, fried garlic and shallot, soy sauce, chilli oil, brown rice miso paste, half the red chilli (without the seeds if you prefer less spicy foods), and vegetable stock to the blender. Peel and mince the ginger and add it to the blender, then blend until smooth. Pour the blended broth into a saucepan, bring to the boil, then add the noodles and simmer until the noodles are cooked (this should only take 1-2 minutes). Once the noodles are ready, divide the ramen between two bowls. Peel and thinly slice the carrot. Then slice the tofu, spring onion and the remaining half of the fresh chilli. Note: if using regular tofu, consider frying it for 2-3 minutes before topping. 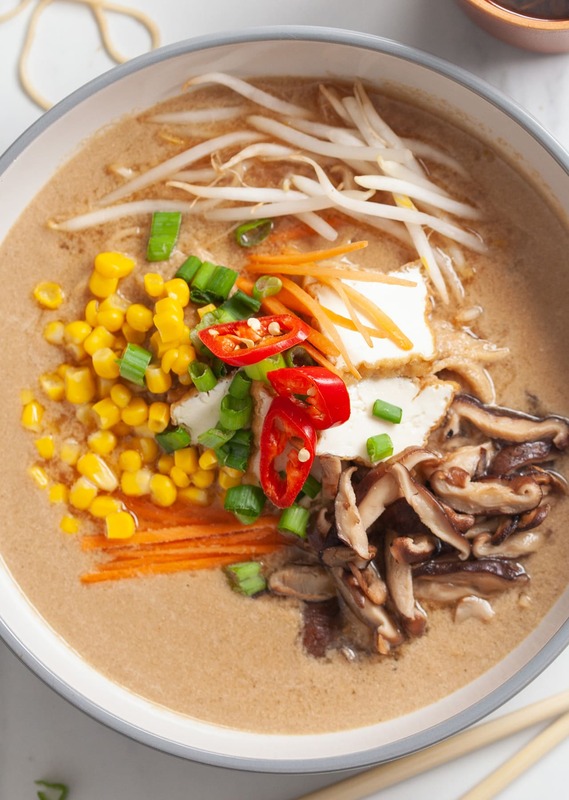 Top each ramen bowl with half the tofu slices, shiitake mushrooms, beansprouts, carrot, sweetcorn, spring onions and chilli. Itadakimasu! Just made this for lunch and it was so good! Didn’t even have all the correct ingredients and it still tasted wonderful. Thank you! Just made this and it is DELICIOUS!! Used dried shiitake and white miso paste but it still came out really well. Thanks guys! Awesome, yeah you can definitely switch up the ingredients. So glad it worked out!